This book is written for researchers, undergraduate students and postgraduate students, physicians and traditional medicine practitioners who develop research in the field of neurosciences, phytochemistry and ethnopharmacology or can be useful for their practice. Topics discussed include the description of depression, its biochemical causes, the targets of antidepressant drugs, animal and cell models commonly used in the research of this pathology, medicinal plants and bioactive compounds with antidepressant activity used in traditional medicine, advances in nanotechnology for drug delivery to the brain and finally the future challenges for researchers studying this pathology. Depression: Definition, prevalence and economic impact. Theories of depression. Traditional and novel possible targets for antidepressant drugs. Cell-based systems of depression. Animal models of depression. Antidepressant medicinal plants and compounds used in traditional medicines all over the world. Europe. Africa. Eurasia and Asia. Central and North America. South America. Oceania. Novel drug delivery systems for antidepressant natural drugs. 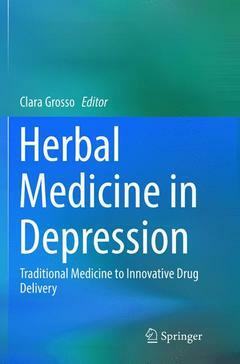 Pre-clinical and clinical data on antidepressant herbal remedies and natural compounds. Future strategies. She is reviewer for more than 20 international journals focusing a broad range of scientific fields, such as natural products, analytical chemistry, neurosciences and biomedicine and she authored 25 publications in journals indexed to Journal Citation Reports from ISI Web of Knowledge. She also authored 2 book chapters, one of them on behalf of the CYTED action 112RT0460 “CORNUCOPIA” thematic network, 5 papers in conference proceedings, 4 oral communications and 15 posters in international meetings. Her total impact factor is 63.536 and her h-index is 11 (scopus database) or 9 (ISI Web of Knowledge). Since 2007, her papers received 254 citations from 191 peer-reviewed papers.